This is a short agreement that allows two or more owners to manage easily the shared ownership, use and costs of any light aircraft, glider or helicopter. It includes aircraft-specific detail. 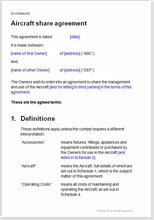 This agreement covers any situation where two or more people share ownership and use of an aircraft for leisure or business. The agreement has been drawn to as to regulate occupation where only one owner uses the aircraft at any one time. However, there is nothing to prevent an owner sharing time with another owner. First, you should consider, what is the most suitable structure for your sharing proposal. If you are looking at a commercial arrangement or one for more than ten people, then it would be better to hold the property in a limited company and buy and sell shares in it. Then ownership of the property itself never changes. No stamp duty is paid once it is bought as the right of occupation can be treated as a license.